Available in capacities from 660 lbs – 6613 lbs. Our NC Hydraulic elevated weld positioners are one of the most precise options you can use to achieve flawless welding results. This positioner promotes maximum quality with an elevated worktable and when weldment is securely fixed, helps you to position your work piece in the most ideal position. The height can also be adjusted while simultaneously working on parts, allowing the operator more flexibility. The speed is controlled by an inverter which provides the most targeted rotation possible. 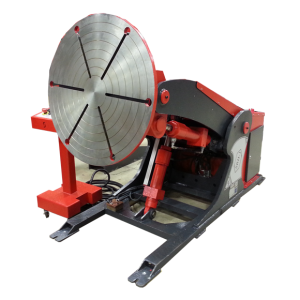 These weld positioners are user friendly with a remote control to facilitate high-quality, professional weldment with operators at any experience level.